Halve or quarter tomatoes so that they are all roughly the same size. Arrange in a single layer on a parchment-lined rimmed baking sheet. Drizzle with olive oil and sprinkle generously with salt. Peel garlic cloves and add to sheet. 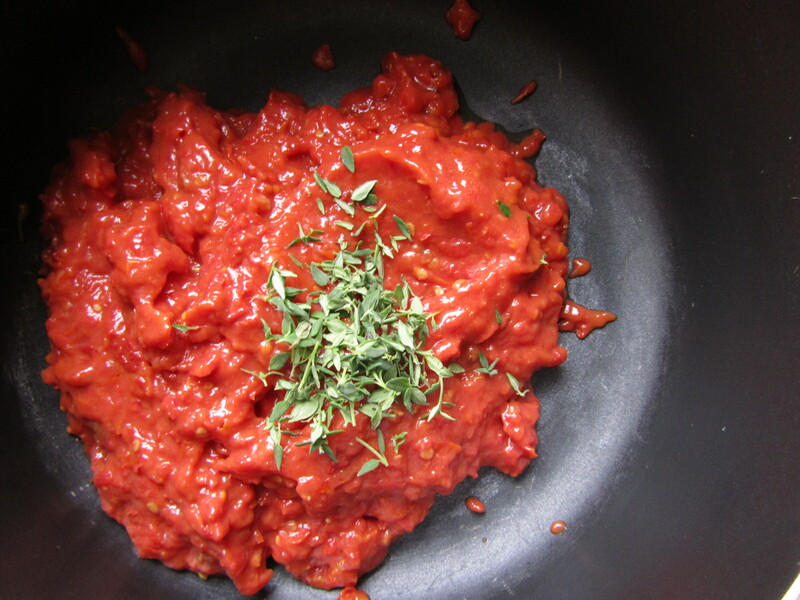 Roast tomatoes and garlic in the oven for three hours, until tomatoes darken and begin to wrinkle. When the tomatoes have cooled slightly, pour them into a food processor with any juice or extra oil that has gathered in the pan. Pulse until they are roughly pureed. 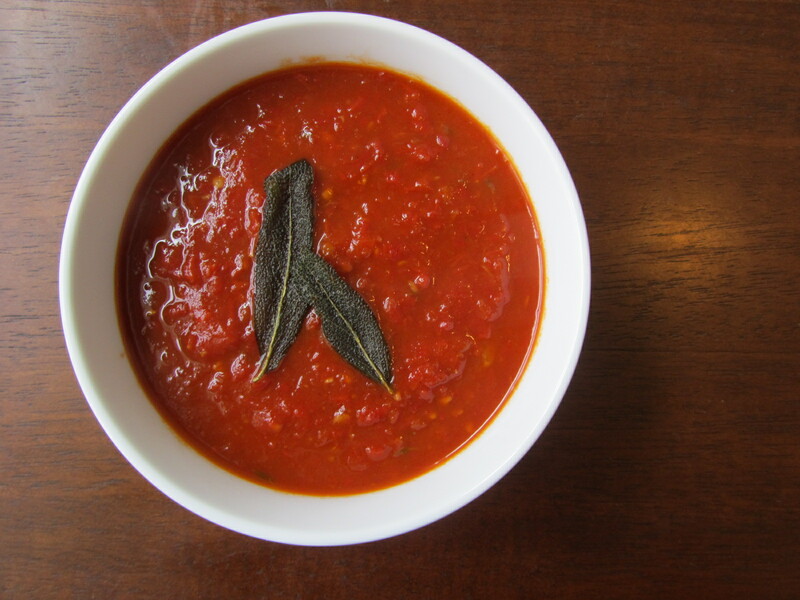 Combine tomato puree and thyme leaves with broth and stir to incorporate. Bring to a boil, then lower to a simmer for 20-30 minutes. It will reduce slightly, but turn it off while it is still on the liquid-y side – a bowl of pasta sauce would be a little too rich. Keep warm. Optional: In a separate pan, heat 2 tablespoons of olive oil. When shimmering, add sage leaves. They crisp up almost instantly. Let drain on paper towels and discard extra oil. 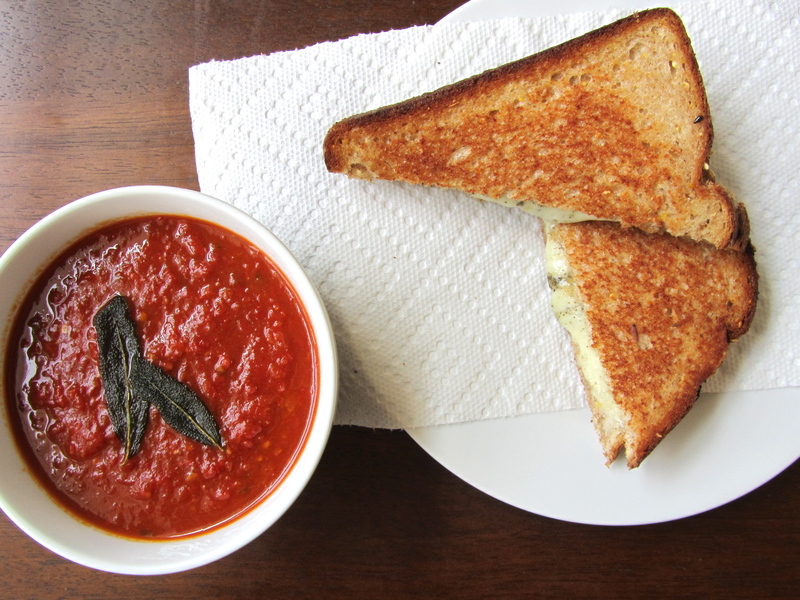 Great with a grilled cheese on the side, of course! This entry was posted in soup, Sweet Life Laur Original, vegetables, vegetarian and tagged fall, roasted, soup, tomato by Laura Zolnoski. Bookmark the permalink.